As of today, 650 WSM-AM is 90 years old.We all know their iconic brand, and even more iconic Grand Ole Opry. WSM first signed on Monday, October 5th, 1925. But the Opry was first broadcast November 28th 1925 so it's 90th anniversary is just a few weeks away. 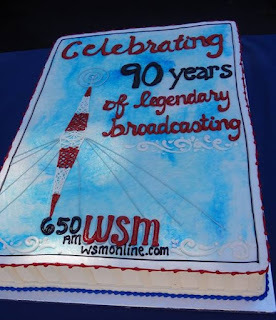 WSM-AM had a cake to celebrate it's anniversary.. funny thing though. It's something they've been doing for a long time. They did it last year with a bit of pomp and ceremony despite the big anniversary being around the corner. Actually these cake images are all over the internet. Here's birthday number 55 [HERE]. 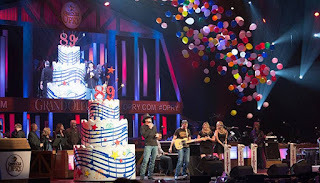 Getty Images even has a few pictures of the WSM 33rd Grand Ole Opry anniversary cake from 1956 [HERE]. If they've been doing it consistently, that would mean their 60th anniversary of ordering radio-themed cakes is in October of 2016. I know personalized cakes are a popular these days but I was surprised at how much so. A slew of other stations have celebrated anniversaries with them as well: WKUF, WNYC, WMSI, KXTE, KBUT, WLFR, KFSH, WGBH, WMBR and many others. Somewhere out there must be a Pinterest page that catalogs this.